We love snow here, but sometimes we get snow days when you just can’t bare being outside, even for a few minutes. You know… those days when it’s -20 degrees with the windchill and stepping outside just for a minute is cutting. Well, on those days, you need to keep the fun indoors. 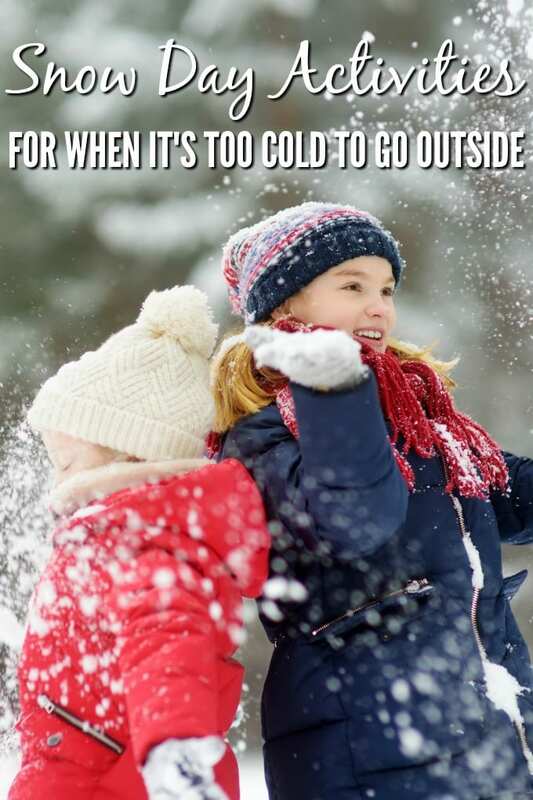 Either bring some snow inside for some of these fun activities, make a cute snow-themed craft, or make some fake snow for hours of sensory play. 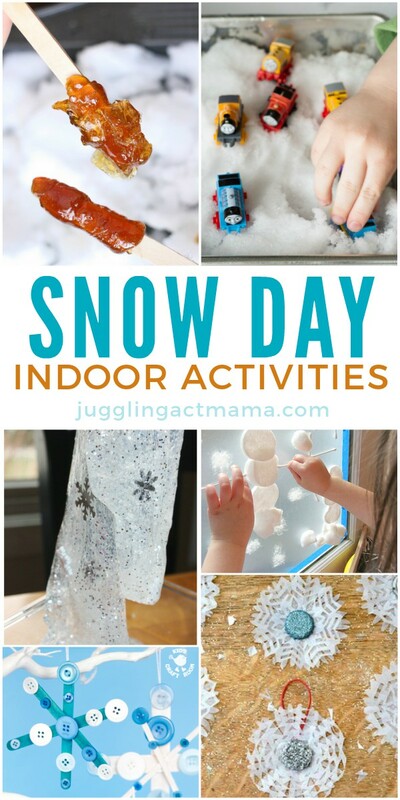 You’re going to love these snow day indoor activities! 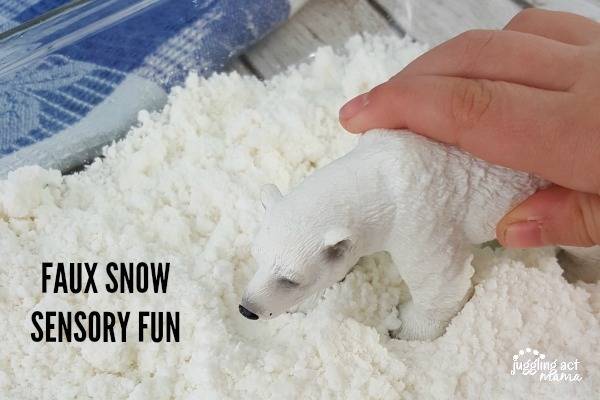 Make some faux snow for hours of sensory fun and play. Build your own snowman in a bag. It’s all the fun of making a snowman without the cold hands and snow-covered mittens! I only recently learned about this yummy Canadian-inspired treat: maple syrup snow candy. Grab some snow, bring it inside and make a few treats for yourself and the kids. Give your brains a little workout with this cute snowflake memory game. Bring the snow indoors! My son loved pushing his trains and cars through his snow sensory tray. Snowflake slime is lots of ooey, gooey fun. Color and work on vocabulary with this fun and educational snow day printable pack. Make some delicious snow ice cream from all that snow outside. Use your empty toilet paper rolls to make this cardboard tube snowman. Melting snowman blow painting is a fun way to paint snowmen using something other than a brush. 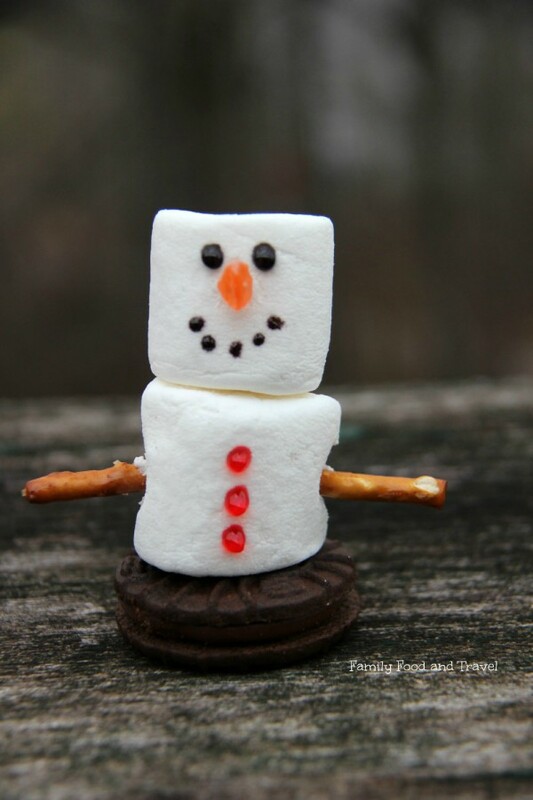 Make some tasty marshmallow snowmen. Aren’t they adorable? Learn about mixing colors by making snow paint. Use craft sticks and foam balls to create snowball sculptures. 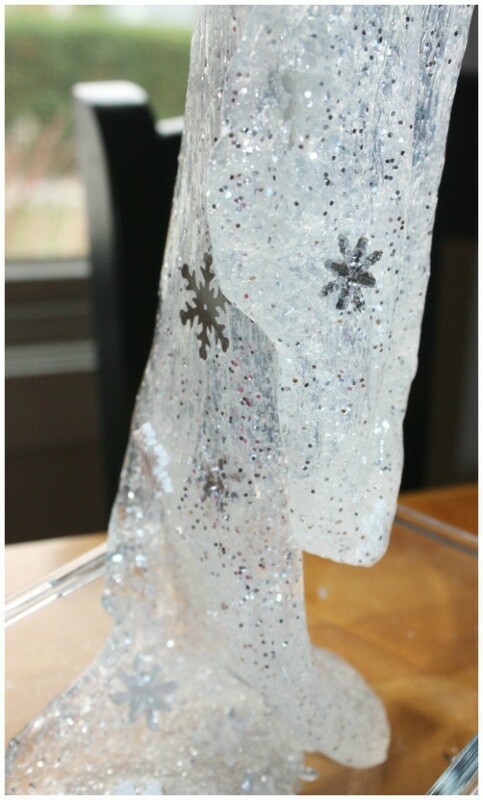 Create a snow window with contact paper and pieces of cotton you have around the house. Get ready to get messy! This puffy paint melted snowman craft is so much squishy fun for little hands. Put those spare buttons you have to use to make this gorgeous button snowflake craft. This would be a fun activity for a Frozen-themed party! Speaking of Frozen, this sparkly play dough is sure to be a hit. I cannot believe how gorgeous these bottle cap snowflakes are. Save them to decorate the Christmas tree in December! Snow days are great for science experiments. Try this snowflake winter science lab and learn together. Put on a puppet show with these no-sew snowman sock puppets. How fun! 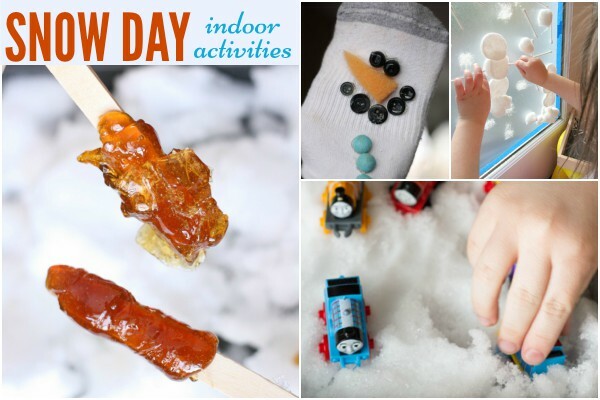 We hope you enjoyed this collection of fun snow day indoor activities! 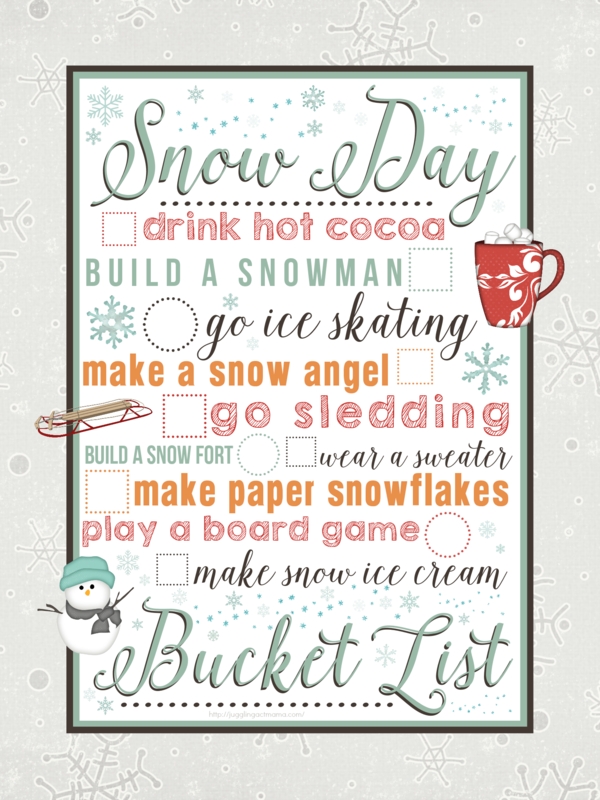 You might also like our Snow Day Bucket List! More Project Ideas Perfect for Snow Days! I love these ideas! I needed something that do with these kiddos today day!! Snowday #5 for our school district!